For the United States Air Force squadron, see 84 RADES. 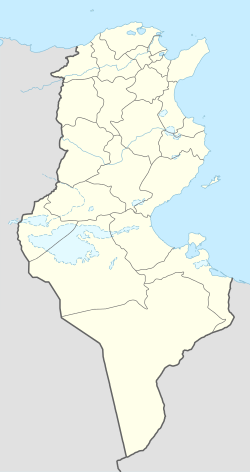 Radès (Arabic: رادس‎) is a harbour city in Ben Arous Governorate, Tunisia. Situated 9 kilometers south-east of the capital Tunis, some consider it a Tunis suburb, and parts of the harbor installations of Tunis are located in Radès. Maxula Prates was a town of the Roman Province of Africa. From the beginning of the Muslim conquest of the Maghreb, the hill of Rades was equipped with a ribat. It is around this ribat, which has long since disappeared, that the village of which it is spoken in the 11th century was built and which seems to have been provided with a port since that time. Under the Hafsides, vineyards spread over the hillsides. Between the end of the 19th and the beginning of the 20th century, members of the Djellouli family built themselves beautiful houses of Hispano-Arabic style, notably the ministers M'hammed Djellouli and Taïeb Djellouli , as well as the Governor Sadok Djellouli. French residents also built bourgeois villas in Europe. One can quote the colonial villa built in 1905 and bought by the Grand Vizier M'hamed Chenik , which gives it Hispano-Moorish and Italian styles; His brother Hassen, a notable landowner, lived in the villa Vacherot, which became his residence in the middle of the 20th century. The modern name of the town, Radès, derives from the Latin expression "Maxula per races" (Maxula by the ferries), Maxula being the original Libyco-Berber name of the village near which is in the Antiquity a station of boats whose function is To connect the terminus of the coastal road with Carthage by sea. The Arabs have retained from this toponymic designation only spleens which they have transformed into Rades. Radès derives its name from the Latin expression Maxula per races (Maxula by the ferries ), Maxula being the original Libyco-Berber name of the village near which is in antiquity a station of boats whose function is to connect the terminus of the coastal road with Carthage by sea. The Arabs have retained from this toponymic designation only spleens which they have transformed into Rades. During the Roman Empire the town was also the seat of an ancient Christian bishopric which survives today as a titular see of the RomanCatholic Church. Despite its small population, the city is internationally known for its sports facilities. Radès hosted the 2015 FIBA Africa Championship, which was played in the 17,000-seat Salle Omnisport de Rades. The Tunisia national football team plays matches at the 65,000-capacity National Stadium of Rades. The city has an internationally recognized club team: Étoile Sportive de Radès. The Maxula-Radès tramway to the sea was tram line that ran between Maxula-Radès station and the Mediterranean coast from 1902 and until the 1920s. The Beylical Decree of July 7, 1902 approved the agreement signed on June 23 of the same year between the Director of Public Works and Mr. Gaudens-Ravotti (industrial and public works contractor) for the construction and operation of a line of Tramway The track was built with a width of sixty centimeters and animal traction was used. The line ran along Boulevard Massicault and has a length of two kilometers. ^ [Titular Episcopal See of Maxula Prates], at GCatholic.org. Wikimedia Commons has media related to Radès. This page was last edited on 23 December 2018, at 20:55 (UTC).